In the hopes of being of help, I'm not going to pull any punches and rate this series a 5 because I thought it was "okay." I'm going to be as honest as I can get about each aspect. The title La Corda d'Oro is not French, as sometimes thought, but Italian. It can be loosely translated as the golden string but what it actually means is The Golden Bond, as in a priceless bond. This is important to the whole story concept. It lasts for only one season. The secondo passo is not a season, as the subtitle implies, but a special. La Corda d'Oro is based on a romance RPG by KOEI. The title refers to the eventual bond of friendship between the main character, Hino Kahoko, and the friends she meets during her musical adventure. In a wider sense, the title also refers to the bond between her heart and her magical violin (which works as a mirror into her being) and so, also refers to the human soul and music. On the surface, the phrase translated as a synonym, the golden string, literally refers to the golden string used on her violin. It's a brilliant title. Unfortunately, the title is the deepest thing about the series. While it shares surface features with Nodame Cantabile, Kaleido Star, Glass Mask, HoneyxClover, and even Snow Fairy Sugar, it is, to use a phrase often uttered in the show itself, "Not of that level." If you enjoy anime about the arts, or so called harems, you might just like this series. However, if what you want is a deep slice of life romance with the emotion of Honey and Clover, or a philosophical story about the performing arts, like Glass Mask, this is neither. If you have never seen any of the above, I would recommend watching any of those first. Above all, La Corda d'Oro most seriously disappoints because it doesn't know what it's supposed to be. A romance? A coming of age? A supernatural mystery? A slice of life about artists? A magical girl series? In not deciding what it is it misses the boat on all of them, and, other than overwhelming boredom, I felt overwhelming disappointment at the loss of potential. La Corda d'Oro is most like Snow Fairy Sugar. Both portray a schoolgirl who, with the help of a spirit friend, finds her true self through the music she loves. Unlike Snow Fairy Sugar, which had a very strong storyline despite the apparent childishness of the series, the theme isn't grasped strongly. This title was not fleshed out properly in order to be a feature show. The supernatural background of the school and its founder is never discussed. The character of Lili/Riri, the music spirit, never becomes more than an excuse to start the show. The lead character is not required to overcome poverty, as in Snow Fairy Sugar, or loneliness because of the loss of her family, as in Fruits Basket. Nor is she required to succeed despite being clueless and making disastrous errors, as in Kaleido Star ... Neither is this series about her one big shot to fulfill a life need despite hardship, as in Glass Mask, Kaleido Star, or Honey and Clover. Other weaknesses aside, the script's biggest problems are pacing and focus. Instead of following a likely pattern of introduction, slow build-up, big reveal, deeper evolution, second big reveal, then grand close, La Corda d'Oro languishes in a series of halfhearted episodes and unrealized issues. Each of the 26 Episodes drag up to a moment of possible importance, then end. It's as if the only purpose of the show was to pull the game events out into an 11 hour story without adding anything else to the script. Maybe that's what happened. The morale to the story, that music should be viewed as an expression of the soul and should be enjoyed, is not well focused. The romance (and this is a romance title if nothing else) is incredibly weak. Wishy-washy would be a good term since there is virtually no real love at all. For that matter, there's no real tenderness or friendship. Character interaction is awkward and it seems as if this lack of emotion is unintentional. As if to own up to this, Ep 26, a recap, exists only to punch through the romance idea in a "very special epilogue." This episode itself is like a 20 minute romance RPG where each character is given a few minutes in their special romantic setting. Yet again, absolutely nothing happens -- and a weird nothing. As if each of these characters were not only devoid of soul, but robots turned off before they finished their task. The special bond between Kahoko and her friends is similarly wishy-washy. We are never really shown why any of these characters are ever drawn to each other at all other than being in the same location at the same time. And that's the main failing of the script -- that it tells rather than shows, which, for a visual program, makes for a very confusing story. The big turning in the middle of the series, which thankfully begins to set the story on a more natural rail, makes no sense because we see no emotion behind it. In retrospect, it can be understood as one of the characters telling Kahoko she is a failure if she cannot own up to her own emotions, and that this makes her both an unattractive person and an unattractive competitor. However, I just said this 100 times better than the anime. The way this plays out is so weak, viewers are left wondering what happened, what the big deal was, and why the characters are all so upset. Even the characters themselves wonder. Characters being upset is another issue. There is a lot of whining in this series, and not about various things -- about the same things over and over, and for no real reason. We do not know why Kahoko is so upset when the spirit of music has explained very clearly to her why she shouldn't be upset, but, if she didn't remain upset, the only thin conflict in the story would go away. Sadly, in keeping the conflict going, she betrays the actual concept of the story -- that she has the spirit of music inside of her and has been chosen to bring it to all who surround her. This is supposed to be why everyone loves her -- because they sense something special and free about her spirit -- but we don't ever really see this. We see a lot of moping. Speaking of Kaleido Star, the main character Kahoko is just as redundant as Sora, but where Sora's repetition is in her upbeat nature (and thus easy to forgive), Kahoko is redundant in her continual whining when the only problem she has is being patroned by a spirit of music. If a series of conflicts had been introduced through character development the script could have had ample opportunity to show Kahoko as the charming girl who thrives in the face of adversity. Instead, we are expected to believe that's who she is because this is supposed to be that sort of story. Imagine Fruits Basket gone terribly wrong. I gave the script a "bad" rating instead of "horrible" because if you pay attention, you can see what the story was supposed to be doing. However, IMHO, this script needed to be thrown out and completely rewritten to be effective. It's almost as if the writers were so against introducing any conflict or weakness they were willing to shoot their own series in the foot. The characters serve their purpose. They are what you expect from a harem, but disappointingly, only that. There is the scattered main character -- a normal, yet somehow uniquely brilliant person who we see coming out of her/his shell. There's the comforting friend character. The un-threatening, energetic character. The superficial mannered one who can never find a place to be themselves. The cool "tsundere." The wilting flower with an iron soul. There's even the nosy school journalist side-character who winds up saying something encouraging. What makes some romance series exciting is how these stock parts only remain so until after the initial introduction, developing into unique characters as the story evolves. In La Corda d'Oro there is no development like this. Not for lack of time or chance but simply because the script chooses to bring up possible conflict after possible conflict and ignore each. If character development isn't that important to you, then this might not be a problem. Be forewarned, however -- if you are bored or frustrated at episode 4 or 5, that feeling won't change. Yunoki Azuma, who suddenly and without much prior time on screen reveals his sadistic inner nature to Kahoko. This is supposed to be him relaxing in front of her because he trusts her above all others, yet, not only is there no build up to this, there is very, very little of it ever shown at all. Azuma is on screen so little that when, at the end of the series, he tells her (in his own special way) she is his favorite person to be around, we are left wondering what episodes we missed. The only thing that keeps the transformation from being completely nonsensical is that you know it's bound to happen ... because that's his character. Tsuchiura Ryotaro, the comforting friend with the mysterious past who overcomes his weaknesses with Hino's help. Neither is his past that mysterious nor does Hino actually do much directly to inspire him, but, that is his character. Despite being the most fleshed out of any of the characters, he appears, then spends a large amount of time forgotten. This is a terrible waste, especially since his predicament mirrors the series concept very closely. In a series like this, the music, characters, and story should be so closely tied as to echo one another. Japanese animation usually excels at this, but here, ironically, it doesn't really work out. There is an attempt to define story arcs by themes used in the school competition, but I frequently found myself forgetting what the selection theme was supposed to be as Kahoko wandered around in the meantime. The music itself fades in both presentation and purpose. Many of the episodes in between the selections are taken up by procrastination; saying they don't know what to play, talking about practicing, talking about not practicing, shopping, crying, and so on. A prodigy added to the contest late when his surprising gifts are revealed, Ryotaro only plays Chopin. At first, I thought this was part of the story, that part of his weakness was that he didn't like to play anything else ... That he would finally be docked points for only playing Chopin and conflict would arise. But this was only because the director seemed unwilling to pick any other music for piano than Chopin. Ryo finally plays a Liszt piece at the end of the series, thank goodness. Each piece is cut so short as to provide us with little time to do anything but see the cut scenes of a crowd, and while they're still wonderful pieces, the anime does no justice by selecting only the most well known of well known pieces then cutting them to oblivion. The Opening and Ending themes are okay. The opening is sweet pop. The song grows on you. The ending theme is forgettable and not appropriate or enjoyable, IMHO. I'm sure there are other tracks being played in the background but if so, these are also forgettable. Viewers seem to either love it or hate it. I think it's ... average. It's not terrible, but reused scenes get tiresome, the expressions are lacking and at many times flat, and most disappointingly, a fantastic opportunity for some technical animation went ignored. This could have been the music series to end all music series. The rendering and animation of the instruments and fingerings alone could have been so much more exquisite and been a real highlight of the entire production. In a way, that this opportunity went unused is just another facet of the series not being what it could have been -- an emotional series about the life of musicians. When i first saw this anime I though well its popular, it should be goodand boy was i right! this anime is amazing!!!! the music is FANTASTIC!!!!!!!!!!!!!! it pulls you in and eventually you find yourself yelling "he's in the closet!!!" and other random things. the characters are unique except the main character is like the average main female character. i love this anime sooo much!!!!! its a great anime to start watching! especially if you have no other animes to watch because it is not one of those animes that stop after 5 episodes. This show is pretty intense, especially considering it's about relationships and music! The characters are deep and easy to relate to, and the music throughout the show is absolutely fantastic. Just when you think you've got one of the guys figured out, something about their personality or their backstory is revealed, and suddenly you see them in a new light! This show had an amazingly diverse cast. Sweet and shy Fuyuumi, strong and dependable Tsuchiura, and upbeat Amou, just to name a few. Hihara is a really fun character, and he really lightens up the mood. Without him and Shimizu, the whole thing probably would've been way too serious. I have to say, I wasn't expecting Yunoki's sudden change of character at all! He flips a switch - between the perfect guy everyone follows blindly. and a creepy closet sociopath constricted by his family legacy. Tsukimori was by far my favourite, because of the transformation he underwent. He went from being this really cold guy who didn't care about anything or anyone... to someone who passionately loves music. And, based on his whisper of "Kahoko" - among other more subtle things - Hino as well! Despite loving this show, I admittedly couldn't muster up too much love for Hino. She responds to everything with exactly the same emotion! Hears someone play music? Shocked. Has a deep conversation? Shocked. Sees one of her friends at school? You guessed it, extremely shocked. Either she has some undiagnosed personality disorder, or the writers completely and utterly failed to show her and the guys chatting in normal social situations. I think the whole show would have been more fleshed-out if bigger chunks of time had been spent on everyday situations. Instead of mentioning a trip to the cake shop or showing a montage of rollercoaster rides, the characters should have been shown having normal everyday conversations once in a while. I don't know much about the show-cancellation process, but it felt weird for Secondo Passo to only have two episodes. If they were intending to create a whole new storyline with those three new characters, and it suddenly got cancelled, that's understandable. But I simply could not focus during the final two episodes because it was very clear that the storyline and potential romance were not going to be resolved. If you finished this show and want to know who Hino ends up dating, do yourself a favour and do a quick search for two ending videos from the final dvd: a sweet song done by Tsukimori's voice actor and violinist, and a final ending scene that shows the result of the "Violin Romance"! First off, I'm really picky about the illustrating style when it comes to watching anime. But the artwork in this one is simply gorgeous. I like how it goes so far as to expand a little on the background of each of the major characters to answer some questions the audience may have. Each character also has their own unique personality that keeps them distinguishable instead of blending together. The music was also greatly enjoyable. I'm already a fan of movie/game soundtracks and instrumental music. Even if you don't enjoy classical music, I can confidently say that aspect wouldn't interfere with you enjoying this anime because of how beautifully it was performed. I have two gripes which keeps me from rating a full five stars: 1) The lack of a definitive romantic pairing between Hino and one of the male characters. But some people enjoy that lack--they can make the pairing of their own preference in their imagination, or not make one at all. 2) Secondo Passo was so short to the point of being unnecessary. It only added more questions: What will end up happening between Hino and Aoi Kaji? Will Akihiko Kira end up ruining the school with his stringent ideals that have no wiggle room? Who is Kiriya Eto? It really bothers me when an anime doesn't resolve major questions the audience may have if they just watch the show and don't bother with looking up the Wiki and/or reading the manga itself. This anime series is so beautiful and very unique. It is the best anime series I have watched in many years. The art and music is breathtaking. The characters are totally believable and deal with everyday life while playing classical music. I have always wanted to learn to play the flute and the piano, so this was special to see it in an anime. 1.) The Secondo Passo (Season 2) only has two episodes which ends in a cliff hanger after adding in more characters - not smart! Why would anyone buy the game when the series wasn't completed. Plus, I was hoping for many more seasons - like maybe over 100 episodes (as the graduate from high school and go to college together) which would satisfy many of us who are hooked on this anime! 2.) It's also not in English dub! It's difficult to read fast and watch what is going on. Facial expressions and body movements are very important to watch in this anime! A Musical Romance Good Or Bad? I thought that the ending needed more of a bang you know. She can't just be friends with all of them she needs to chose a guy she likes. I thought that Hino Kahoko ws a nice and sweet young lady who always stiks up for her friends. She was totally fine with not wining the Music Contest. I believe that they could of done a much better job with this Anime Saga. This series, When i first started watching it didn't seem very interesting to me. I found the characters to be kind of odd and the story line was very hard to follow in the beginning, But once you get passed the first few episodes you start to see a diamond in the ruff. This series is very well written and animated. Very good life lessons in it as well. The story grows on you and you become addicted. The music is all great considering it's some of the worlds best (Literally). Characters are very good, I rated them good because I'm a "Silent but deadly" Character fan and there were not many of them in this series. Animation is great but it's not Perfect. All in all you should really watch this. It's something everyone should experience. All in all, I really did enjoy this anime, if you like anime that mainly focuses on character development and the love and struggle of music, this is an anime for you to watch! 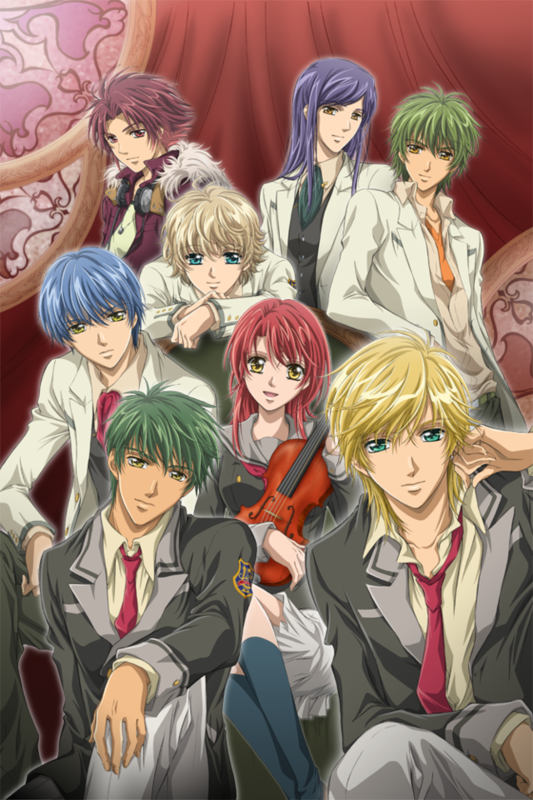 La Corda d'Oro is one of my favorite anime shows because it had a great storyline, characters, and music. I have seen a lot of anime and this would be in my top 20! One anime this reminded me of was Uta No Prince Sama which is also a really good anime.